Now this isn’t the largest niche in the game or the easiest to get into, but once you have the pattern & have the required skill level, the Rich Purple Silk Shirt could make you thousands of gold. Looking at the Wowhead link above, it shows a drop chance of just 0.2% or lower. If you have a level 34-45 alt & are running dungeons at that level, you may get very lucky & pick one up. You could also just watch the Auction House & hope someone sells one without knowing its’ true value! I decided to push my luck however & spent several months handing in Dense Grinding Stones at the Darkmoon Faire. If you buy your Dense Stone throughout the month, you should be able to pick up a stack for 1-3g. The price does shoot up in the few days before the Faire arrives though so be aware & check your in-game calendar. The NPC you need to find is Kerri Hicks & you will need to complete the quest ‘Rituals of Strength’ numerous times (up to around 2000/6000 friendly reputation) before you get offered the quest ‘More Dense Grinding Stones’. At this point, you will no longer gain reputation but both quests require 8 Dense Grinding Stones per turn in & both reward 20 Darkmoon Faire Prize Tickets. The next step is to hand in the prize tickets for the Lesser Darkmoon Prize (the 12 ticket option) & then open up your prize bags. Normally you will get a piece of green armor in the level 30-37 range or a variety of profession recipes & patterns. I picked up numerous Journeyman’s Backpacks too. So if each prize has a base cost of 2 g 88 s, you can use that as your lowest price for selling any of the green items you get – I pushed my luck & made 5 g my minimum sale price initially & most of it sold! But don’t forget, I started the maths with the highest price I am willing to pay for my original dense stones – if you are lucky & can get all your dense stone for 1 g per stack or less, each prize actually costs you less than 1 gold! So what is the point of all this waffling? 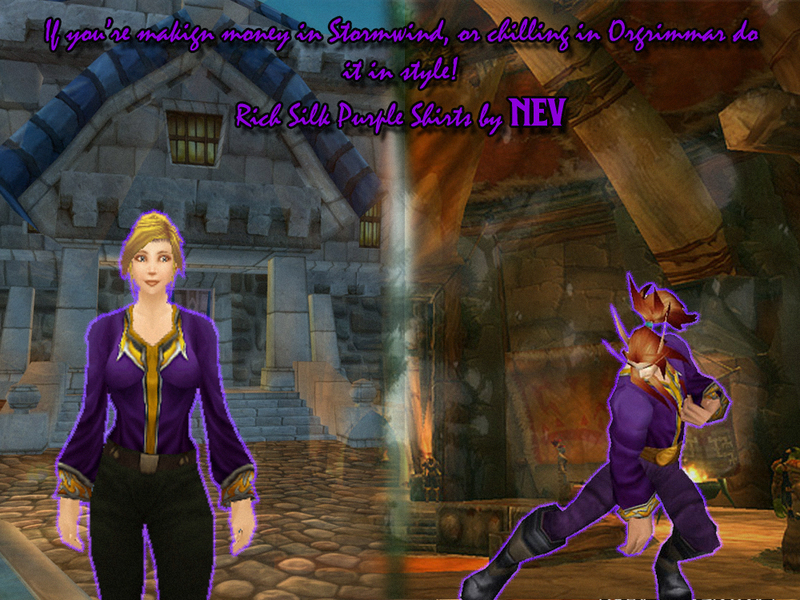 Well, it took me maybe 4 Darkmoon Faires & 150-200 gold but I eventually got the pattern for the Rich Purple Silk Shirt & I’ve been selling about 12 of these per month ever since at 78 g each! I’m the only Alliance on my server selling them so I’ve set my price fairly high. Definitely my favourite niche, give it a try.